As I was thinking about the state of the accessory market I realized how good we have it at the moment. There is almost an overwhelming amount of options out there for almost any firearm you have. You can get different stocks, sights, barrels, triggers, scopes, electronic sights, compensators, flash hiders, magazines, flashlights, lasers, or mounting rails for almost any weapon out there. Don’t like the finish on your firearm? There are companies out there today that can create almost any design you can dream up on your firearms. There are also finishes that you can buy and do yourself. Usually I don’t make too many changes to my firearms after I purchase them. Most of my rifles have scopes on them and all but one or two of my handguns have at least aftermarket stocks on them. On handguns I feel that a nice pair of stocks is an easy way to dress up and personalize a firearm. One of the latest handguns I’ve done this to is my Beretta Stampede. It is a standard model so it came with the black plastic checkered stocks. I never really cared for them, however it took me a while to figure out and find the ones I wanted. I settled on ivory colored polymer ones because I really liked the way it dressed up this revolver with its case hardened frame. I also felt it added a classic look to it. I purchased another pair from a small company that I found on the internet. When I received them they were not like the picture, but because of the cost I tried to see if they’d work. 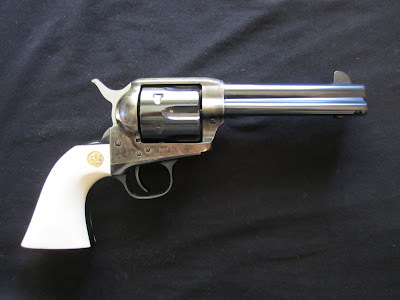 I don’t know which revolver they were made for but it sure wasn’t the Stampede. The shape was all wrong and they were way too big. Luckily I was able to find a pair of the Beretta branded ones on the accessories website and ordered them. These, no surprise, fit it just right. They also make it feel a lot better in the hand. Even though they are smooth they don’t slip around in my hand during shooting. Now that is with some light .45 Colt loads and I wasn’t sweating so I’ll have to see how they perform long term. What are your thoughts on this subject? What do you like to do to your firearms to individualize them?